U.S. Geological Survey scientists have unlocked historical patterns of atmospheric mercury deposition preserved in ice cores from a midlatitude glacier. For the first time, scientists have resolved historical mercury emission events such as major volcanic eruptions, the California Gold Rush, and industrialization associated with the past century. In addition, the comprehensive study has shown decreases in mercury deposition that correspond to the time period when the Clean Air Act and other emission reduction strategies became prominent. Krabbenhoft, D.P. 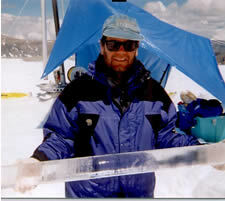 and Schuster, P.F., 2002 , Glacial Ice Cores Reveal A Record of Natural and Anthropogenic Atmospheric Mercury Deposition for the Last 270 Years: 2002 U.S. Geological Survey Fact Sheet FS-051-02, p. 2. Schuster, P.F., Krabbenhoft, D.P., Naftz, D.L., Cecil, L.D., Olson, M.L., Dewild, J.F., Susong, D.D., and Green, J.R., 2002, Atmospheric mercury deposition during the last 270 years—A glacial ice core of natural and anthropogenic sources: Environmental Science and Technology, v. 36, no. 11, p. 2303-2310.